The profession of teaching today is one of the most important professions practiced by a human in general, especially for teachers, because the impact of these on all individuals of society is clear and visible too. As teaching has a great impact on the personality of the individuals: his mental development and his awareness of things around him. The main objective of this research is to find out how the question-and-answer method affects students' academic achievement, compared to traditional methods of teaching. In our research, we have systematically used the experimental approach. The sample of the study was the students of the fourth stage in the Department of History. The researcher came to a set of results, where the statistical evidence proved, the effectiveness of this method on the achievement of students and its positive impact. Hence, the researcher suggests conducting other similar research but using other methods of teaching, such as the method of discussion, presentation or scientific statement to ensure the quality of the appropriate method of teaching. Bahat A. Saeed, lecturer in faculty of education, history department. I got BA certificate in physical education at Koya University faculty of Education in 2009. She got M.A certificate in methods of teaching at Koya University in 2014. حمدامین، ره‌مه‌زان،2014، ریگاوشیوازه تیۆری وپراكتیكیه‌كانی وانه‌وتنه‌وه‌، هه‌ولیر، چاپخانهی رۆژهه‌لات. محمد، یاسین عمر وقادر، ئاراس محمد،2014، بنه‌ماكانی تویژینه‌وه‌ی زانستی وفیربوونی جوله‌، چاپی یه‌كه‌م، هه‌ولیر، چاپخانهی رۆژهه‌لات. الامین،شاكر،2005،الشامل فی التدریس المواد الاجتماعیة‌،دار اسامة‌ للنشروالتوزیع،عمان،الاردن. جابر،ولید احمد،2005،طرق التدریس العامة‌ تخطيطها و تطبيقاتها التربویة‌،الطبعة‌ الثانية‌، دارالفكر،عمان الاردن. جرجش،میشال،2005، معجم مصطلحات التربیة‌ والتعلیم الطبعة‌ الاولی،دارالنهضة‌ العربیة‌. حسن،احمد،2017،مهارات وطرائق التدریس الحديثة طريقة الاسئلة،منظمات حكومیة‌ المفهوم وتاسیس. عبدالحمید،علی احمد،2010،التحصیل الدراسی وعلاقتها بالقیم الاسلامیة‌ والتربویة‌،مكتبة‌ حسین،الطبعه‌ الاولی،بیروت. محمد،عایده‌،2014،تقدیر الذات وعلاقتها بالمستوی الاجتماعي الاقتصادي والتحصیل الدراسي لدی طلاب المرحلة الثانویة‌ بمدارس محلیة‌ جبل اولیاء،كلیة‌ الدراسات العلیا،جامعة السودان. SAED, Bahat A.. The Effect of the Question and Answer Method on Student Achievement. 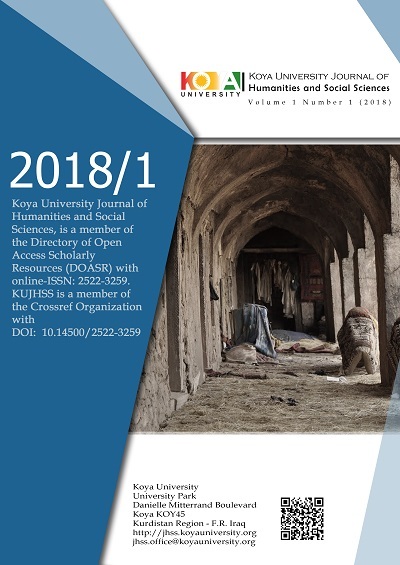 Koya University Journal of Humanities and Social Sciences, [S.l. ], v. 1, n. 1, p. 67-75, apr. 2019. ISSN 2522-3259. Available at: <http://jhss.koyauniversity.org/index.php/jhss/article/view/209>. Date accessed: 23 apr. 2019. doi: https://doi.org/10.14500/kujhss.v1n1y2018.pp67-75.